I’m standing here in my kitchen, listening to the sound of my paring knife slicing through a crisp apple. “Scheeeoomph! thud. Scheeeoomph! thud.” Laying out pale, juicy wedges, rimmed in a blush of red across the cutting board. The fruity scent…tangy, honey-like, and clean rises like a cool morning breeze, refreshing my mind. The color of the apple, the sound of the paring knife, even the direction I’m facing takes me back to my gramma’s kitchen with light flooding in through spotless windows. She gives me an apple to shine…in the days before twisting the stem, whispering the alphabet to find out the first letter of the boy who likes me. I pick up the textured glass salt shaker…my mouth watering at just the thought of the gushing, sweet apple…dotted with tiny crystals of salt. Back when salt wasn’t bad for you yet…it was special, enhancing the enjoyment of an apple…or a slice of cantaloupe or tomato, coaxing out every bit of deliciousness held within. Hmmm…I haven’t had salt on an apple in years. I pick up the shaker and flick a light shower of salt over the cutting board. I am enjoying this apple, as a child without a care in the world. Just like I did in Gramma’s kitchen with the shiny countertops and the spotless sink and the square chocolate chip cookies leaning over each other in a jar on the table. Square cookies? That is a story for another day. It was a simpler time…one in which I was more present and appreciative of each simple, yet wondrous detail of life. I am coming around to that place again…the savoring of the little things. It’s a pity when our minds are so full of schedules, deadlines, problems and worries–strung tight, locked-up with thoughts about everything and anything other than where we are. The wonder, of those things right in front of our faces, eludes us. Even now as you are reading, isn’t it amazing that the shapes of these lines, curves and dot, dot, dot’s can bring my thoughts across so many miles into your world? That you have an incredible mind and eyes and soul to read and comprehend these words and let them swirl around in your life for a while? 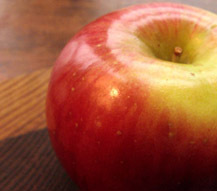 I look at this apple; it really is beautiful in its color and shape…and it’s delightfully distinct “apple” flavor. I ponder the magnificent variety…the vast array of flavors that there are to enjoy in life. Endless. Extravagant. It’s so easy to pass right over these simple wonders…allowing “more important things” to weigh us down and consume our lives. Why in the world do we fix our minds on things that dull them to what can bring us true pleasure? Distractions that deprive us of much-needed peace. The peace that refreshes us, gives rise to moments of clarity…and opens our eyes to the pure, enjoyment of life. Next Post holes or heights?